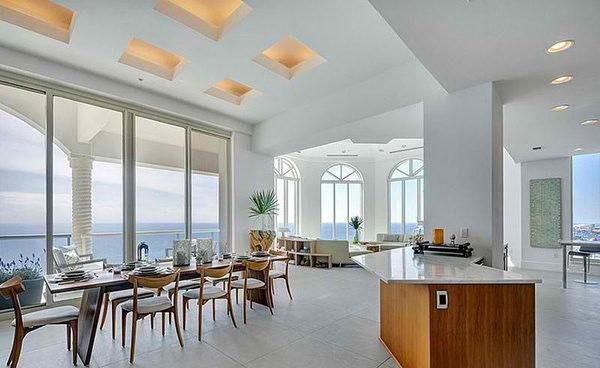 A spacious and luxurious apartment called the Florida Penthouse is not just gifted with space but it also offers an interior with an overwhelming feel. Because of the generous space in it, an open floor plan was devised by the designers comprised of a living, dining and kitchen areas. 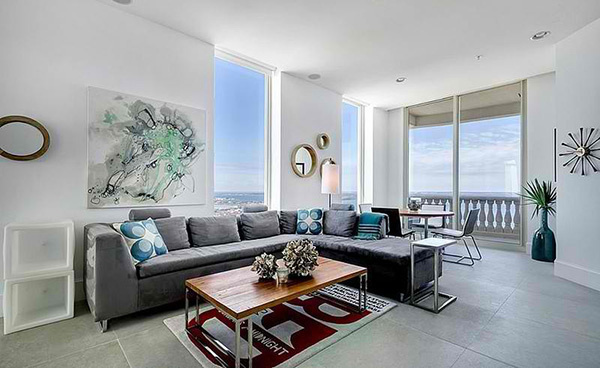 It also have an attractive lounge zone that opens up through a floor-to-ceiling window towards the terrace. Character is mirrored in every element of the interior showcasing a wide array of materials and textures. But you can feel and see the coherence of the space through its color palette that is well distributed and retained all throughout the house. 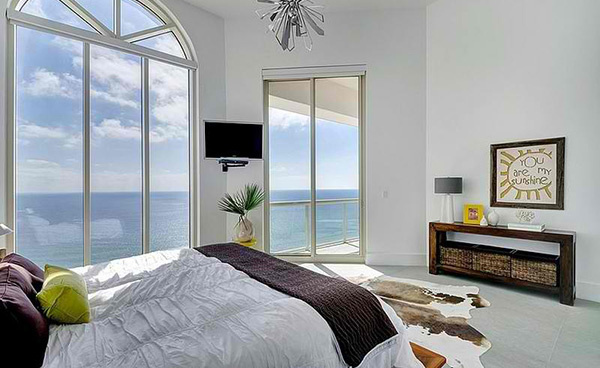 There are different bedrooms too that are all designed with sophistication and free of clutter. One spot, aside from the lounge zone that will appeal to many is the terrace that provides a perfect view of nature. This is the lounge zone which is one area of that house that looks very inviting in its high ceiling and beautiful furniture. Aside from the curved sofa, you can see that storage areas are added on its back which are true space savers. 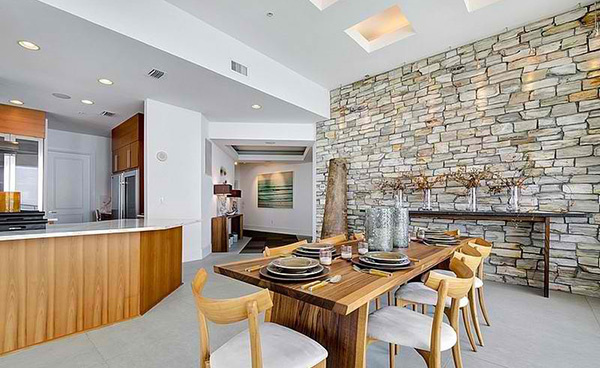 The stone walls on one side add more beauty to this dining area that is comprised of a wooden dining set. 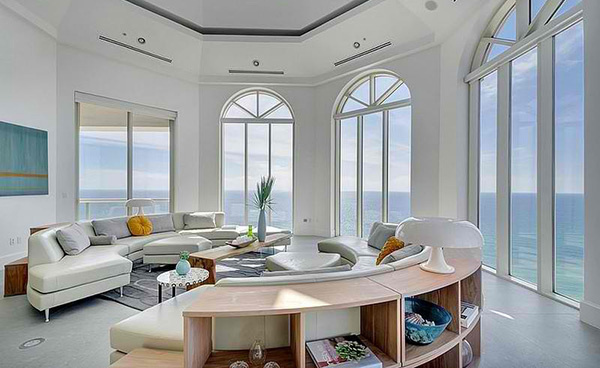 The use of floor to ceiling windows lighten up the interior of this penthouse. 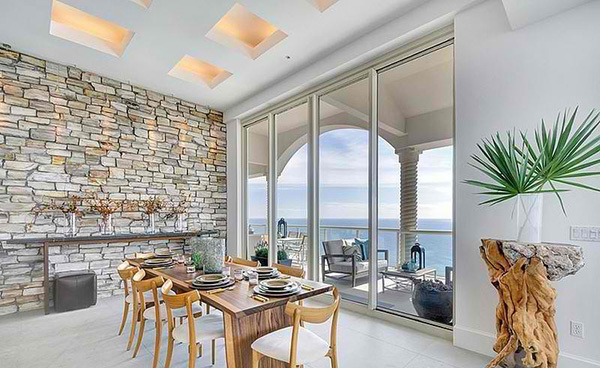 The wooden dining set, stone walls and the plant decors on top of the table close to the wall jive well together. 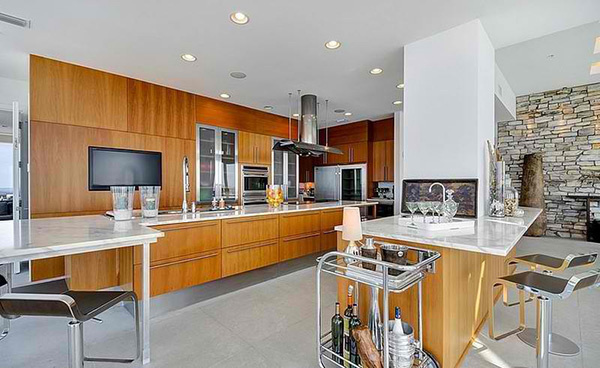 Near the dining area is the kitchen and this bar that has white colors and wood in it. 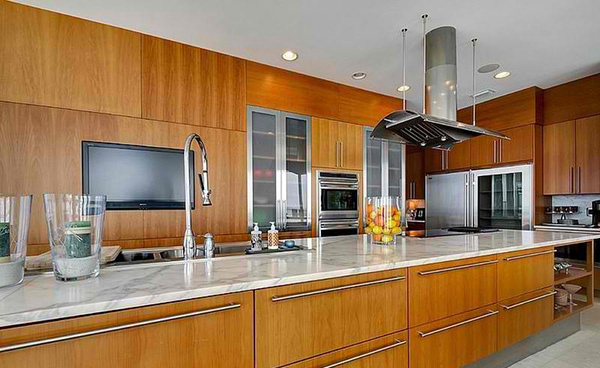 One neat kitchen with stainless equipment that looked great with the white countertop. We like the how the cabinets were built in the wall. The living area of the house have blue and gray colors in it. Don’t you love that area rug with type on it? Just beside the living area is this small table which can be perfect for a breakfast for two or even for afternoon snacks. 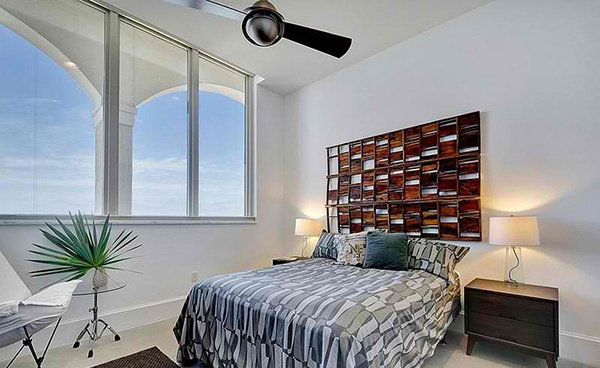 That sunburst wall decor is a perfect accent to this bedroom that is filled with the light from the sun. 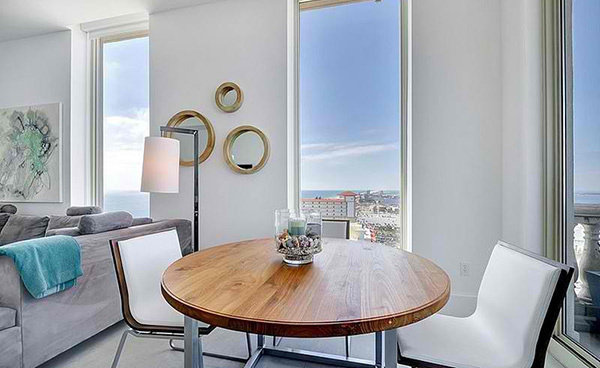 Aside from the television mounted on the wall, the only thing that you could see here is this low table with baskets for storage. 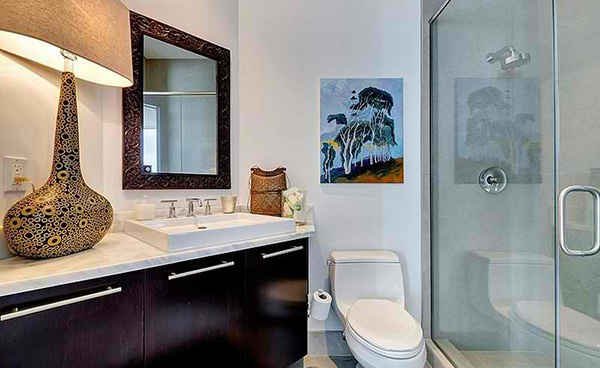 Adding decors in the bathroom will liven up the space especially if it is in all white. 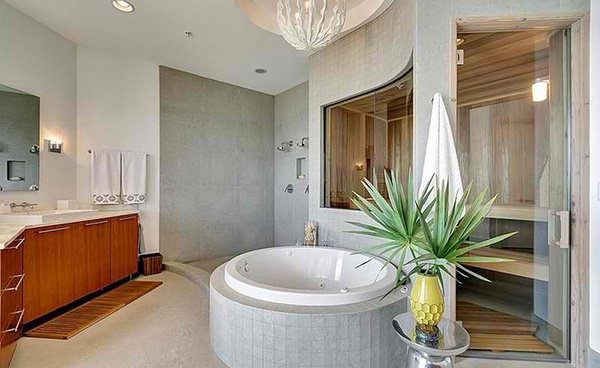 Another bathroom in the house with a round tub that is perched against a curved wall. 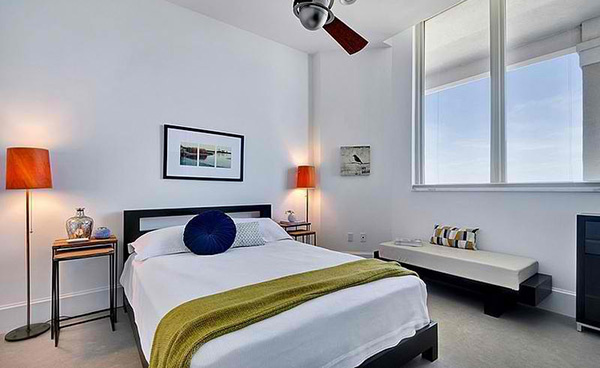 Like the previous bedroom, this is also minimally designed with some pops of colors from the twin floor lamps. This one has a beach-y feel with blue covers printed with water themed design and an organic wall decor. 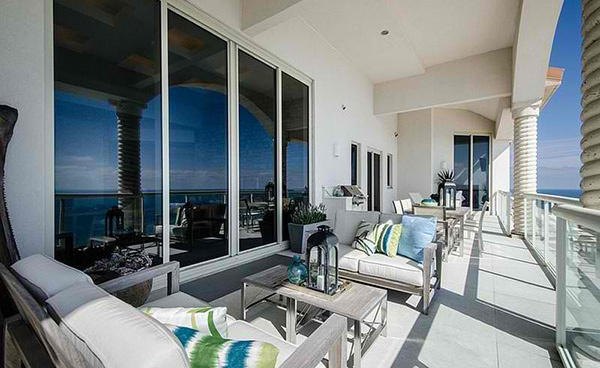 This spacious terrace is a perfect spot for relaxation. 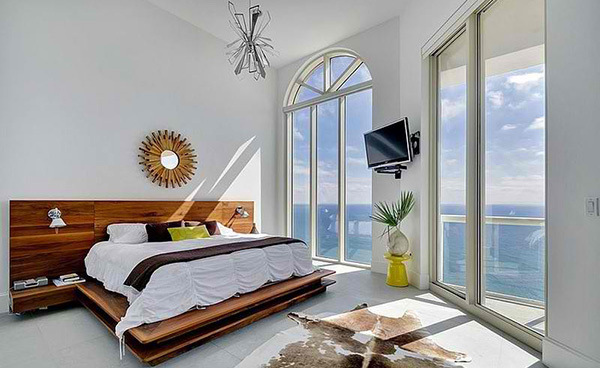 Comfy and beautiful furniture were added to it as well as some throw pillows with colors coined from the beach. Each corner of the house showcases captivating elements that will surely inspire us to apply a similar idea to our own homes. 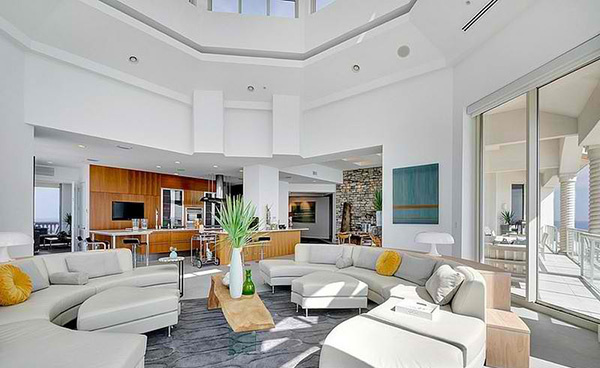 We love the lounge zone with curve sofas since it really is created for conversations with friends and family. The color palette is very cozy too. Photographs were taken by Jason Parker who sure had a great time taking photos of the complex features in the interior. Can you tell us which your favorite part of the house is?